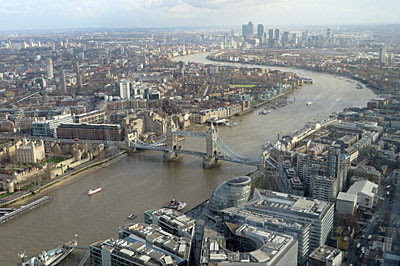 When The View From The Shard opened to the public three years ago, I looked at the price and decided not to bother. £25 seemed a bit steep to ascend the tallest building in Western Europe, amazing though the view might be, and even that required booking ahead and risking it with the weather. The price has since gone up another pound, indeed it's now £30.95 if you turn up on the day, which is tourist-milking of the rankest order. But then the best bargain in London came along, so I've been up for rather less, and I'm going up again, and again, and again. Last Monday at Stupid O'Clock in the morning, the ticket desks at the Shard opened early to dispense special 'Love London' tickets. These cost £20.16 and allow unlimited access to The View from The Shard for the rest of the year - that's less than the usual cost price and you can go up as many times as you like. Phenomenal value, I'm sure you'll agree. Only 2016 of these tickets were made available, hence long queues built up, and yet unbelievably the entire stock didn't quite sell out on day 1. More to the point, "Due to popular demand, 500 additional Love London cards will be available for purchase on Sunday, 31 January 2016 from 10am." You need to live in London, you need to bring a utility bill and photo ID, and you can only buy on behalf of yourself. But I'd be willing to bet that if you turn up this morning (or even this afternoon) you'll easily bag one, particularly given how poor the weather forecast looks. And then you can go up the Shard in sun, in fog, in rain, in darkness, indeed at any time it's not totally booked out between now and New Year's Eve. I'm going at least once a month, at a cost of £1.68 a time, so maybe see you up there? The Shard rises 1016 feet above what it likes to call London Bridge Quarter, but you probably think of as London Bridge station. Going up is a minor faff, thanks to the not entirely unexpected requirement that everyone proceeds through a full body security check. Then there's the lift, or rather two lifts, the first of which whisks you up to the 33rd floor at ear-popping speeds. From here you're ushered round the lobby to lift number two, which feels slightly slower, and this deposits you on (blimey) floor 68. The view starts one floor up, which means stairs, although there is another lift if accessibility is an issue. And finally you step out onto a broad lofty (indoor) viewing platform, wrapped around four sides of the central shaft, and all of London is laid out before you. No, really, all of London. Normally when you go up a tall thing in London you can see a long way, perhaps to Wembley's arch, but not quite to the outskirts. Up here the horizon is a distant upland ring, in part the North Downs, in part the Chilterns, confirming that the capital is indeed hemmed in by green. I easily picked out the four tower blocks at Ponders End and the church at Harrow on the Hill (but not the O2 because it's hidden behind Canary Wharf). This is all in decent visibility, of course, you wouldn't want to be up in here overcast gloom... although with an annual ticket I will of course be up at some point to check. Nobody is looking at the horizon. The Shard rises amid some of the most famous real estate in the world, much of which is straight down, so everyone's staring at that. Tower Bridge is close by to the east, St Paul's not far to the west, and the Gherkin/Walkie Talkie/Cheesegrater cluster immediately to the north. Tiny trains file into London Bridge station, immediately below, and journey onwards along model railway tracks. 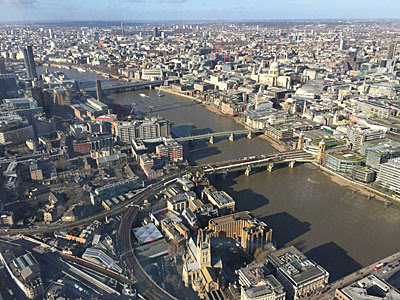 but the Thames is the main point of interest, snaking off in each direction, with a particularly impressive meander heading off towards Docklands - if you've ever wanted to fully understand central London's geography, up here is the place to do it. And everybody is taking photos, of course they are. This means polite jostling for the best spaces by the window, perhaps waiting patiently until the couple or family between the struts have moved on. Some have cameras, others are attempting to zoom in on their phones, while others blunder in with oversize tablets. Grinning groups with selfie sticks are surprisingly thin on the ground, but most people want photos containing themselves or with other family members in, just to prove they were up here. The Shard even has its own official photographer, impeccably groomed, skilled in pressing his clients up against a chosen backdrop, point and click. Except this isn't the ideal location for a photo. Every shot is through glass, which means annoying reflections in certain directions, and smeary blotches where it's rained. They send the windowcleaners down regularly, you'll have seen them on the news, so it's by no means a critical issue. But direct sunlight can be more of an issue, making staring into south London tricky at midday, and Westminster potentially dazzling in the afternoon. Overcast skies solve that issue but diminish the rooftops of London somewhat, so getting a perfect shot is unexpectedly hard. Getting a unique shot is impossible - remember thousands have already taken (and shared) exactly the same substandard picture as you. And then there's upstairs. 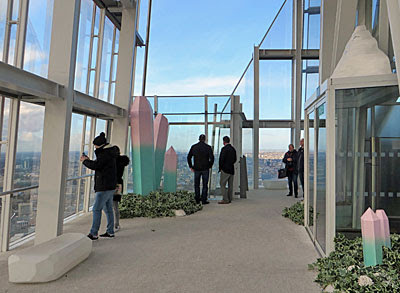 Three internal flights of steps lead up to the observation deck on floor 72, a full 244 metres above ground level, where a member of staff advises you to put your coat on. This level is open to the elements, but still mostly shielded by a rising spire of glass. In midwinter it's definitely nippy up here, and the wind whistles surprisingly loudly around the rooftop. But that's all good because it keeps the numbers slightly lower, so you're more likely to get a window to yourself and breathe in the amazingly open view. Reflections in the glass may be slightly more of an issue, but wow, won't you look at that? There are of course little added extras to improve the experience. The highest bar in London, for starters, dishing out warming drinks and alcoholic beverages... for a lofty price. Champagne starts at £10 a glass, but plenty of bubbly was flowing for those who'd come up the Shard to celebrate a birthday, anniversary or special event. There are nibbles too, currently candy floss and popcorn to match the midwinter makeover that 'events' duo Bompas and Parr have given the upper level. Essentially it's a white carpet and some frosty crystalline decor, so nothing amazing, but it's being removed after tomorrow after which the viewing deck should then return to normal. The upper deck is by no means the top of the building - technically the tip of the Shard is floor 95 - but you won't be passing through the maintenance access gate and climbing the increasingly narrow spire. Even so, you might be wondering how confident you'd be standing here behind glass, at a ridiculously high altitude above London. Fear not, my head for heights sometimes completely fails me but I was absolutely fine, which I suspect is thanks to the building's tapering profile. And rest assured that once you're up here they don't kick you out, you can hang around as long as you like to get value for money. I shall be going back to get phenomenal value for money throughout 2016.